Jammu, Aug 29 (IANS) Former Jammu and Kashmir Chief Minister Omar Abdullah on Tuesday accused the BJP of trying to turn the issue of Article 35A of the Indian Constitution into a Hindu versus Muslim issue. The BJP was also trying to convert the issue into a state versus rest of the country issue after falling short of arguments to justify their moves on the matter, the National Conference Working President said while addressing people in Darhal area of Rajouri district. 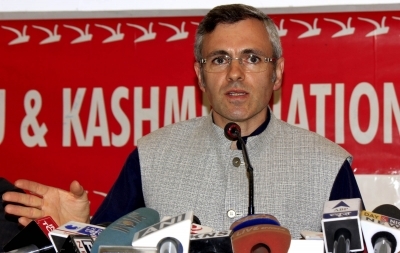 Abdullah asked how could critics of the National Conference point fingers against it for opposing what he called were clandestine moves to get repealed Article 35A, which he said was a constitutional guarantee to the people of Jammu, Kashmir and Ladakh for preserving their distinct identity and dignity, irrespective of religion or caste. He accused the Bharatiya Janata Party of dividing people on region and religion lines to further its anti-people agenda. “Article 35A reflects our identity, it allows us to shape our destiny, and so we cannot let it go,” the former Chief Minister said. The National Conference leader cautioned people not to remain complacent on this sensitive issue. “The pen and inkpot party (People’s Democratic Party’s election symbol) had been conceived to further the agenda of the Rashtriya Swayamsevak Sangh and the BJP in this state”, he claimed. Omar Abdullah accused the PDP of submitting to the BJP’s whims and fancies, be it on the Goods and Services Tax or the National Food Security Act. He said GST implementation was a “tremendous setback” to the state’s fiscal autonomy while the NFSA had broken the backbone of the poor. “I opposed the Food Security Act’s implementation despite frequent demands by our then alliance partner the Congress. By agreeing to implement the NFSA, the PDP has forced the state’s people into submission and deprived them of the bare minimum rations,” the former Chief Minister said.